The Evanston Community Orchestra was established in 1945 as an offshoot of the Northwestern University Orchestra, when returning GIs and others looked for an outlet for their musical talents. Lucille and Jack Ryan, along with Timothy Fetler as conductor, were the founders. Mr. Ryan was associated with NBC in Chicago and persuaded Elwyn Owen, the NBC radio organist, to become the full-time conductor after Mr. Feller graduated from Northwestern University. In 1961, the orchestra officially became the Evanston Symphony Orchestra with its incorporation as an Illinois not-for-profit organization. In 1962, Frank Miller, principal cellist with the Chicago Symphony Orchestra became the ESO's conductor, bringing his expertise of working with the great Toscanini and Pablo Casals. He groomed the amateur musicians into a highly accomplished, community orchestra, which it remains today. Maestro Lynn Schornick was the Music Director of the ESO from 1983 to 2002. In 1996 he was awarded the Conductor of the Year award by the Illinois Council of Orchestras. After Dr. Schornick’s retirement, the ESO searched for a year for a new Music Director. In June 2003, Maestro Lawrence Eckerling, of Glenview, was appointed as new Music Director. From its beginning, the ESO has been a volunteer-managed and operated organization. The ESO continues to enjoy the support of Evanston and the surrounding communities as a leader in the arts. The ESO has won numerous awards from the Illinois Council of Orchestras. In 2014, Maestro Eckerling was named Conductor of the Year. The ESO was named Orchestra of the Year in 2010. David Ellis was named General Manager of the Year in 2012. The Evanston Symphony Orchestra received the 2001 Evanston Mayor’s Award for the Arts. It has received numerous other awards from the Illinois Council of Orchestras, including the 1998 Community Relations Programs of the Year and the 1999 Marketing Program of the Year from the same organization. The ESO also won the 2004 and 2009 Board President of the Year Award and the 2006 Volunteer of the Year Award from Illinois Council of Orchestras. 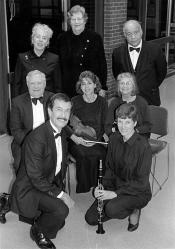 The ESO won 2007 Community Relations of the Year Award and Lawrence Eckerling won 2007 Conductor of the Year Award. The Evanston Symphony Orchestra works to provide diverse, enjoyable and accessible musical entertainment that enriches the audience, orchestra and community. It encourages the development, diversity and wider participation of audiences. The ESO created KidNotes, program notes for younger listeners which gives easy to understand explanations of the evening's concert. Our early education program, Music in Your World, is a collaboration between Head Start, Pre-K, and the ESO to bring quality music education to underserved 3–5 year olds, and is funded with community support. We bring some soloists into Evanston Township High School to conduct master classes with the senior students. We work to ensure that our tickets are highly affordable. Seniors get special rates. All children under 12 are admitted free to our season subscription concerts, and student tickets are only $5. To provide further diverse musical entertainment, the ESO has joined forces with other noted community groups such as Dance Center Evanston, Music Institute of Chicago, Evanston Children’s Choir and North Shore Choral Society. An Evanston Symphony Christmas, now known as the Evanston Symphony Holiday Concert, is a firm family holiday favorite. The ESO gives free pre-concert lectures and recitals named Musical Insights at The Merion, a retirement community, in downtown Evanston. Our complete perfomance history is also available as an Acrobat PDF download. Tales from the Vienna Woods, J. Strauss Jr.
Radetsky March, J. Strauss Sr. The Beautiful Blue Danube Waltz, J. Strauss, Jr.
8:00 p.m. Jan. 30, 1998 (ETHS Auditorium) (*) Play me a Picture! Paint me a Tune! 8:00 p.m. Jan. 22, 1999 (ETHS Auditorium) (*) Play me a Picture! Paint me a Tune! Pizzicato Polka and Emperor Dances, J. Strauss Jr.
[2nd Half]: Gloria in Excelsis Deo, M. Hayes (Evanston Symphony Festival Chorus); Donkey Carol, J. Rutter (Evanston Symphony Festival Chorus); The Many Moods of Christmas, No.4, R.R. Bennett (Evanston Symphony Festival Chorus); Christmas Carol Sing-Along; Hallelujah Chorus from “The Messiah”, G.F. Handel (with ESF Chorus and audience). 2:30 p.m. May 2, 2010 (Pick-Staiger Concert Hall) (*) Play me a Picture! Paint me a Tune!